John Tenney was playing in a punk band in a San Francisco dive late nights while performing early evenings at the San Francisco Opera around the time that we were introduced. John is one of the greatest musicians with whom I have ever had the pleasure of performing. During my life, I have played with some fantastic fiddlers but none better than John. We have not performed together since this project; I miss him and hope to play music again with him soon. Whether adding a rhythm or a fill or a space, John’s musicianship is unequalled. Thank you, John. This recording would never have been made were it not for Scott Gordon. Scott insisted that he and I would perform together when we met for the first time. He brought recording equipment to several concerts and worked personally with the engineers at each venue. He made all the studio arrangements for the tunes we recorded in Petaluma. He mixed and mastered the project at his home and played drums on all tracks. Scott has a love and knowledge of music, particularly American jazz, that is incredible. Also, I strongly recommend that you not play Scottie ping-pong for any sort of money. Thank you, Scott. Jeff Turner and I have known each other for quite a few years now. We worked together one season on “The City of Napa”, a paddle-wheeled riverboat that toured the wine country in Napa County, California. When we met, Jeff was playing electric bass in a surf band called “Pollo del Mar” (which means “Chicken of the Sea”). I entertained the tour groups that were bussed in to enjoy the paddle-wheeled cruises. Jeff’s mother, Barbre’, owned the boat and Jeff would help out in any capacity that was needed at the time. An ex-girlfriend of his, Natasha, told me that Jeff was an excellent bassist and suggested that we jam. After Jeff received a “real” bass as a gift from his cool Mom, he was drafted to play in my band (to the everlasting consternation of his first wife, Natasha) and he has become one of my favorite musicians and good friends ever since. Thank you, Jeff. I must give extra credit to John Tenney, Julie Smolin, and Su Buchignani(Jumpin’ Bobcat fiddlers all at one time or another) for the “close harmony’ and “doubling” that you hear on the particularly fast pieces. The violin and harmonica are so different in so many ways and the arrangements crafted by John, Julie, and Su create a blend that is remarkable. John is the "lucky one" who plays fiddle on this CD. Thanks to all the folks at M. Hohner Inc. for the excellent harmonicas and support. Rick Hatfield and the Jumpin' Bobcats deliver a wonderful set of swinging jazz inflected blues fired by Hatfield's superb harp and the fiddle attack of John Tenney; with Scott Gordon (drums) and Jeff Turner (bass) anchoring the rhythm section with great panache and an innate sense of swing. As you can tell by the title of this CD, there is a strong sense of 'tongue in the cheek' mischievousness and fun with this band, which is continued on the opening track, 'Play Mitzy For Me', a frantic boogie with Hatfield's harp pyrotechnics matched by the exquisite swing of the gypsy/jazz inflected fiddle. 'Goin' to Chicago' is an infectious shuffle that features Hatfield's naturally bluesy vocals, beautifully understated guitar and superlative harp, Tenney, the fiddler providing delicious fills before breaking out with a stunning solo which is matched by Turner's bass repertoire. There are shades of Grapelli permeating the relaxed swing of 'Good Evenin' Blues'; 'Cherry Red & Blue', the tale of a cherished Austin Healey, rides an hypnotic bass riff over which Hatfield's harp shimmers iridescently; whilst 'Uncommon Trains' is a live demonstration of Hatfield's dazzling technique, phrasing and imagery as he plays solo before the band segue in replete with some virtuoso violin. The West Coast swing of 'Flip Flop', and the 50's styled jump blues of 'Right Away, Baby', with it's hip vocals and pumping bass lines, where harp and violin intertwine seamlessly, are further delights on this highly recommended set. 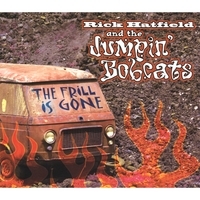 Mix great songs, a knockout band, and a fine sense of humor and you might get Rick Hatfield & the Jumpin’ Bobcats if you’re lucky. Hatfield is a white-hot harp player, singer, and guitarist, joined here by a tough yet subtle rhythm section and fiddler John Tenney. There’s plenty of variety — rockabilly, shuffles, swing — on The Frill Is Gone (self-release), but the faster cuts (“Flip Flop,” “Play Mitzy for Me”) will get your doggies shaking.